Ewan works undercover as a bodyguard for a small arms dealer. When the dealer is assassinated and a quantity of Semtex is stolen, it is up to Ewan to find the thieves and stop them from using this powerful weapon. 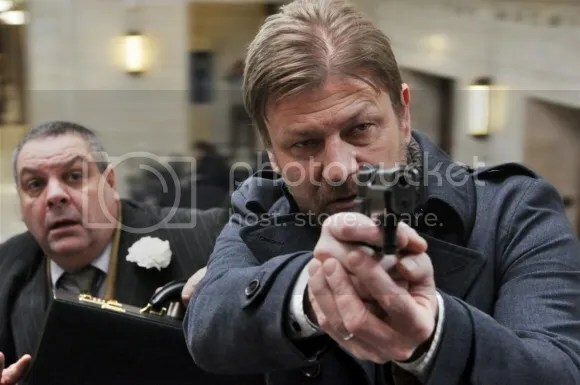 In the aftermath of The Lord of the Rings: The Fellowship of the Ring, Sean Bean became best known for playing tough guys in Hollywood movies. Just as he began to move away from this kind of role – thanks to playing Eddard Stark in the first season of Game of Thrones – he has been pulled back in with Cleanskin. Bean plays a secret service agent, trying to bring down a small arms dealer. The character is not much of a stretch for Bean, all he has to do is look mean and angry, wield a gun and have no mercy. There are moments where it is hinted that the character has a dark past, but he remains a loner, dedicated to his work. The supporting cast are equally as one note; Charlotte Rampling is criminally underused, and Tuppence Middleton, James Fox and Michelle Ryan are given very little to do. The only actor who is allowed to change and grow throughout the movie is Abhin Galeya as Ash, but he starts off hot tempered and never really calms down after that. There are touching moments between him and Kate (Middleton), but these are few and far between. Writer/Director Hadi Hajaig has managed to create an unfunny, less tragic version of Four Lions. Both films follow the change of their central characters into extremists who believe that suicide bombing will beget change. Four Lions went from funny and silly to tragic, but Cleanskin just plods along on one note for most of its running time. The search for the thief is interrupted by flashback, which explains why Ash decided to do what he does, and this serves to break any tension that has been built until this point and confuse the viewer. Charlotte Rampling’s character is never really given motivation for what she does, and characters change sides so quickly it is hard to keep up with what is actually happening. The pacing is off and the flashbacks do nothing to help improve this in fact, they slow it down even further. If the film has been told in chronological order it may have worked better, but the jumping back and forth through the characters’ timeline leaves the film feeling messy. It is clear what Cleanskin was trying to do, and the idea that no one person is inherently good or inherently evil is one that would have worked well, if the film was not so drawn out and, frankly, boring. There are moments of action that manage to speed things up a little, but the characters are underdeveloped and, in the end, the audience sympathy goes more to the innocent bystanders than any of the central characters they are presented with. Cleanskin is the perfect example of when good films turn bad.